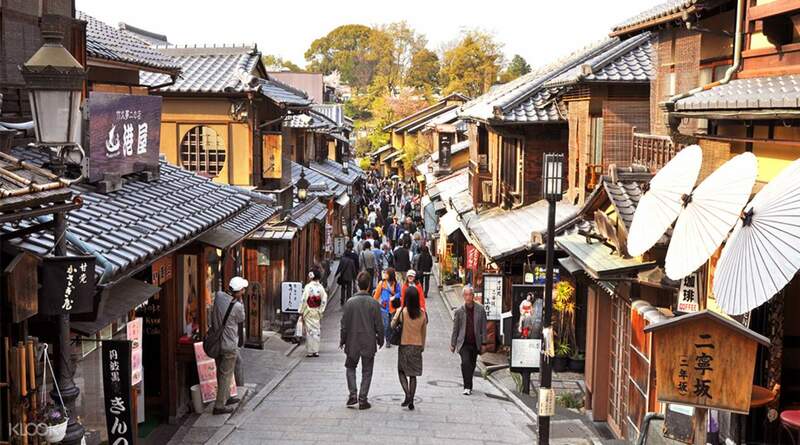 Explore Japan’s ancient capital and turn back time as you explore Kyoto’s must-see historical sites. 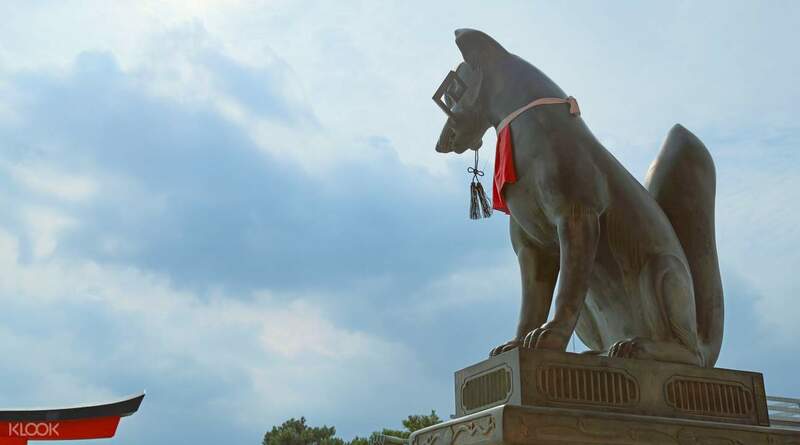 After departing from Osaka, the tour will head to Fushimi Inari-taisha, a shrine with ancient origins dedicated to the god of rice and sake. It is most renowned for the thousands of orange torri gates that mark the seemingly unending pathways towards the hillside shrines. 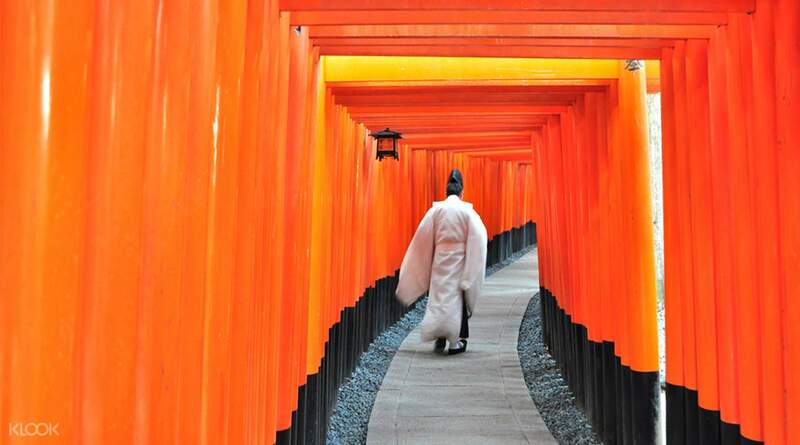 This iconic walkway immediatley evokes the symbolism of traditional Japan and makes for some striking photographs. Next on the tour is Kiyomizu-dera where you’ll have a washoku or Udon set meal lunch depending on your tour package. 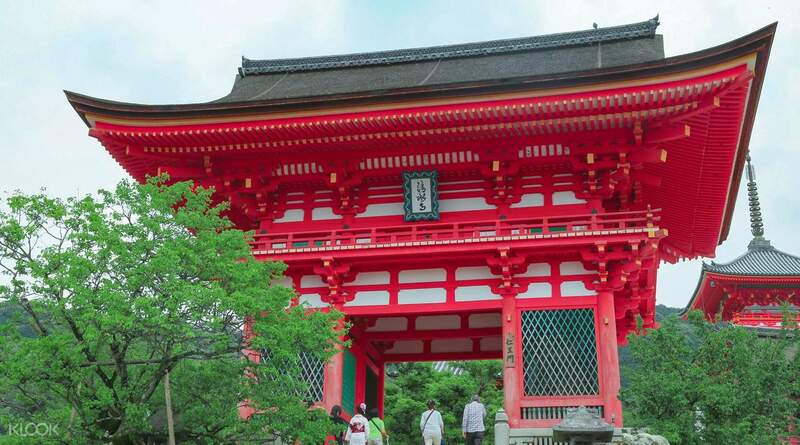 This traditional wooden temple is famous for its unique construction, serene tranquility and also offers spectacular views over the vibrant cherry blossom gardens. 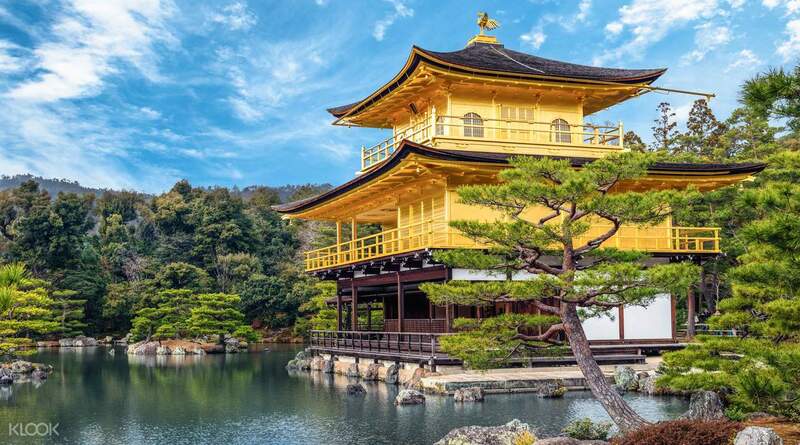 The guided tour will finish at the Kinkaku-ji Zen Temple, also known as ‘The Golden Pavilion’ – and for good reason! The top two floors are entirely covered in gold leaf and the image of this shimmering temple mirrored in the calm waters of the reflective pond will certainly take your breath away so make sure to have your camera at the ready! Finally after more than six months when this previously booked tour was cancelled due to terrible typhoon, this tour was everything we expected it to be. Fast paced, organized and right on time. The tour allowed us to visit what wouldn't be possible if we did a Do It Yourself tour within a day. While the group was big, got a little lost looking for the bus, it was worth the Transport Only tour we wanted. Finally after more than six months when this previously booked tour was cancelled due to terrible typhoon, this tour was everything we expected it to be. Fast paced, organized and right on time. The tour allowed us to visit what wouldn't be possible if we did a Do It Yourself tour within a day. While the group was big, got a little lost looking for the bus, it was worth the Transport Only tour we wanted. Meeting point is easy to find at OCAT 1F. Bus left on time and we visited all places as stated. Our tour guide Jewell was very friendly and helpful too. Definitely recommend if you are short of time and want to see all important places in Kyoto in one day! Meeting point is easy to find at OCAT 1F. Bus left on time and we visited all places as stated. Our tour guide Jewell was very friendly and helpful too. Definitely recommend if you are short of time and want to see all important places in Kyoto in one day! Meeting place area was very convenient as I stayed in Namba area. It was just a 10mins walking distance! I super enjoyed this trip as our tour guide was very polite and accommodating. Before each destination she would tell something about the history of the place. She will also recommend the best photo area in every tourist spot. So make sure you stay close to your tour guide! Meeting place area was very convenient as I stayed in Namba area. It was just a 10mins walking distance! I super enjoyed this trip as our tour guide was very polite and accommodating. Before each destination she would tell something about the history of the place. She will also recommend the best photo area in every tourist spot. So make sure you stay close to your tour guide! It was a good tour. The guide was very friendly and made sure everyone was well taken cared of. There was also enough time to explore the place, grab a quick bite or two, as well as buy some souvenirs around the area. Pick up point was also easy enough to find, it was a well-organized tour. It was a good tour. The guide was very friendly and made sure everyone was well taken cared of. There was also enough time to explore the place, grab a quick bite or two, as well as buy some souvenirs around the area. Pick up point was also easy enough to find, it was a well-organized tour. Our tour guide was very helpful, informative, and always available to answer questions. She also provided a lot of historical information of the various shrines we went to. She also personalized her service by asking all of us individually what we needed, where we were going after the tour so she can help us find it, etc. If you like temples, this is good but time is a constraint for some of them. Our tour guide was very helpful, informative, and always available to answer questions. She also provided a lot of historical information of the various shrines we went to. She also personalized her service by asking all of us individually what we needed, where we were going after the tour so she can help us find it, etc. If you like temples, this is good but time is a constraint for some of them. Very good arrangements of the places. In one day can go to 4 different place definitely worth for it. Travel guide very friendly and polite . (Thanks you so much Hiro-san). For those really want to get visit Kyoto Temple and Shrine without hassle can consider to buy this voucher. Definitely will recommend to my friend which going to visit Osaka-Kyoto. Very good arrangements of the places. In one day can go to 4 different place definitely worth for it. Travel guide very friendly and polite . (Thanks you so much Hiro-san). For those really want to get visit Kyoto Temple and Shrine without hassle can consider to buy this voucher. Definitely will recommend to my friend which going to visit Osaka-Kyoto. I loved the tour since you will see the temples all in 1 day without the hassle of commuting since you're all in a bus tour. The temple tour is nice but for people who can't walk long distances with stairs may have a hard time. Sitting area is limited to none. Again this is a walking intensive tour. FYI The udon meal is OK but not memorable. We were not happy with it to be honest. There are lots of food stalls so if you're OK with it then you're good. But if you're travelling with seniors get lunch for them so they can rest. The rest of the group went to see the bamboo forest, I stayed and explored the other area. The Golden Pavillion is breathtaking! Bus tour guide can speak english and friendly. I loved the tour since you will see the temples all in 1 day without the hassle of commuting since you're all in a bus tour. The temple tour is nice but for people who can't walk long distances with stairs may have a hard time. Sitting area is limited to none. Again this is a walking intensive tour. FYI The udon meal is OK but not memorable. We were not happy with it to be honest. There are lots of food stalls so if you're OK with it then you're good. But if you're travelling with seniors get lunch for them so they can rest. The rest of the group went to see the bamboo forest, I stayed and explored the other area. The Golden Pavillion is breathtaking! Bus tour guide can speak english and friendly. perfect tour!!! but limited time. from transpo, to food everything is perfect. plus our tour guide speaks very good english and very accommodating. she treats us like a family. Norika is the name of our tour guide. she makes sure everything is okay. highly recommended tour. perfect tour!!! but limited time. from transpo, to food everything is perfect. plus our tour guide speaks very good english and very accommodating. she treats us like a family. Norika is the name of our tour guide. she makes sure everything is okay. highly recommended tour.